While most people enjoy watching the grass and flowers grow in lush gardens, Jessie Jarvis prefers observing them flourish under the sea. Since then, Jarvis has worked to protect submerged aquatic vegetation populations. Her research focuses on the effects of environmental stressors on plant development and submerged aquatic vegetation reproduction. 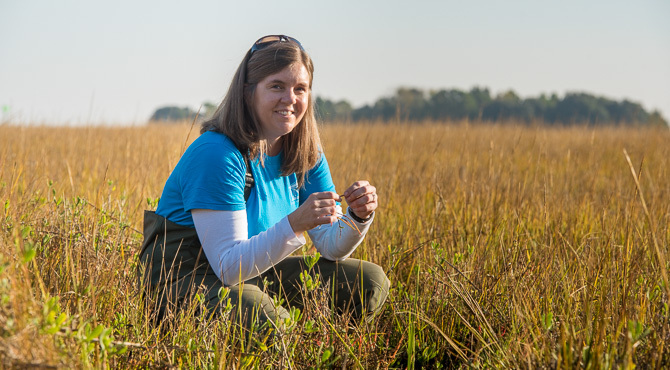 Jarvis’s goal is to provide information to agencies and policymakers charged with management of seagrass habitats to increase the efficiency and effectiveness of coastal management. Jarvis learned at an early age that if you want to ask your own research questions, you need to be in charge of a lab. She conducts much of her research at the UNCW Center for Marine Science. Jarvis became aware of UNCW while working as a teacher assistant at the College of William & Mary. Several students stood out academically, she said. Jarvis joined UNCW in the fall of 2015, and has loved every minute of it, she said.